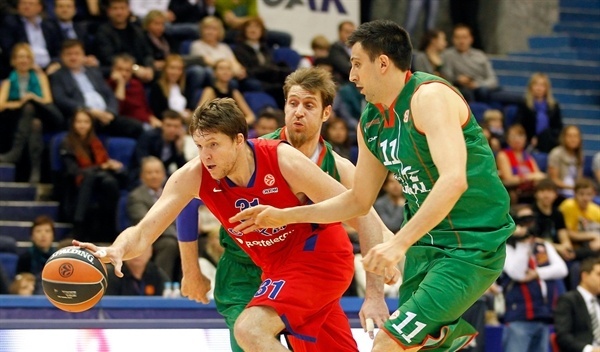 CSKA Moscow struggled in the first quarter, but when it got going, the Russian champs put the game away. CSKA dominated Caja Laboral Vitoria 90-68 in Game 2 to take a 2-0 lead in their best-of-five playoffs series Friday at Alexander Gomelskiy CSKA Universal Sports Hall in the Russian capital. The hosts scored almost as will, making 31 of 43 two-point shots. The hosts also dominated the boards 35-24. 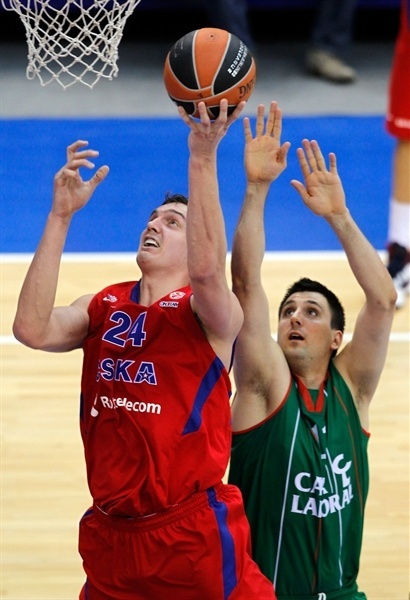 Sasha Kaun, Nenad Krstic and Zoran Erceg all scored 16 to lead the winners. Milos Teodosic added 14 points, 6 rebounds and 7 assists, while Vladimir Micov netted 11 and Viktor Khryapa tallied 9 points, 9 rebounds and 5 assists. Maciej Lampe, who missed the entire second quarter with foul trouble, led the Caja Laboral attack with 19 points. 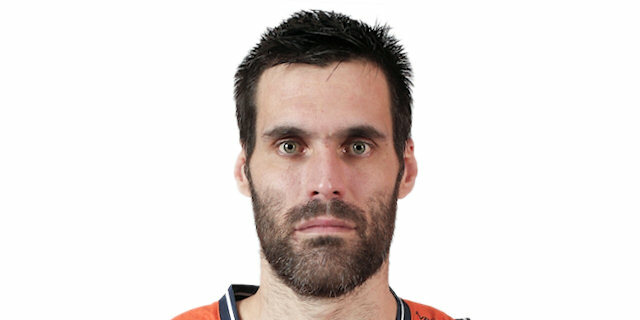 Fernando San Emeterio scored 13 and Fabien Causeur 12. Lampe started strong as Caja Laboral grabbed a 12-21 edge, but CSKA countered with runs on 9-0, 15-2 and 14-0 in the middle two quarters to take a convincing lead and never let up. Game 3 – and if necessary Game 4 – will be in Vitoria, Spain, next week. CSKA went inside early for baskets from Erceg and Kaun. Lampe kept Vitoria even before the hosts heated up. Despite a pair of missed free throws from Lampe, Andres Nocioni’s first points and a triple from Omar cook boosted Vitoria to 4-9. Nocioni followed an Erceg slam with a triple for a 6-point edge. 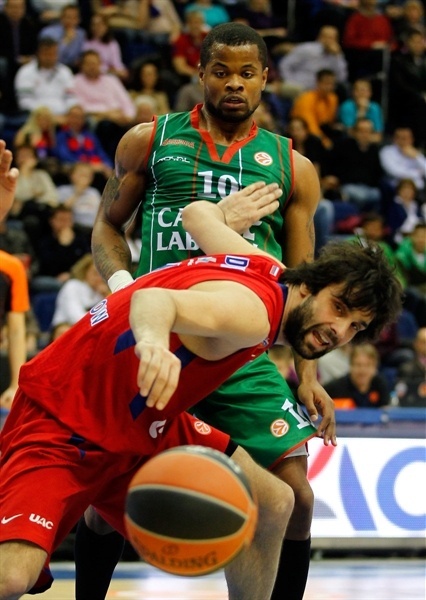 Teodosic got involved as he drove the lane for a basket-plus-foul – Lampe’s second foul. Lampe remained in and kept his team in front with a triple. Lampe reached 9 personal points before his steal led to a Nocioni basket. A Fabien Causeur jumper left the crowd silenced with the score 12-21. However the momentum shifted with a basket-plus-foul from Krstic – the third foul for the Vitoria center, who took a seat on the bench. Cook connected from downtown and his steal and assist to Causeur kept Caja Laboral firmly in front. Sonny Weems drove the lane for a last-second layup to make it 20-26 through 10 minutes. 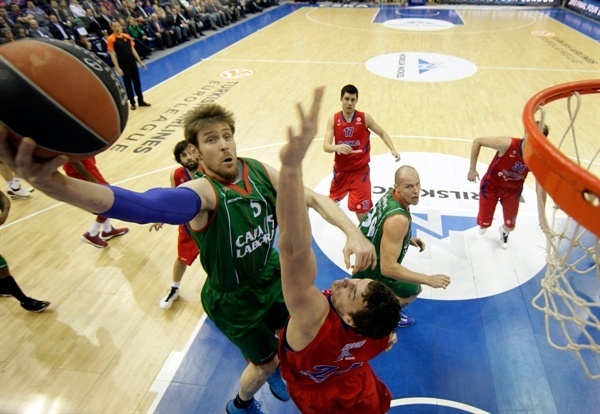 CSKA continued its comeback from the start of the second quarter. Kaun free throws and an Erceg triple brought the hosts within 1. Khryapa then sliced the Vitoria defense with a perfect pass to Kaun for a two-handed slam that capped a 9-0 run. 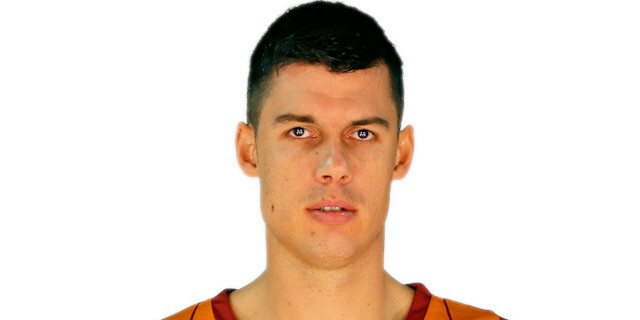 Thomas Heurtel found Tibor Pleiss inside off a broken play to end a four-and-a-half minute Vitoria scoring drought. A short jumper by Krstic tied the game at 31-31 midway through the quarter. Teodosic restored a CSKA lead with a nifty drive and finger roll before nailing a triple. Nemanja Bjelica tipped in a San Emetrio miss, but the hosts kept the pressure on with buckets by the big men, Kaun and Krstic. 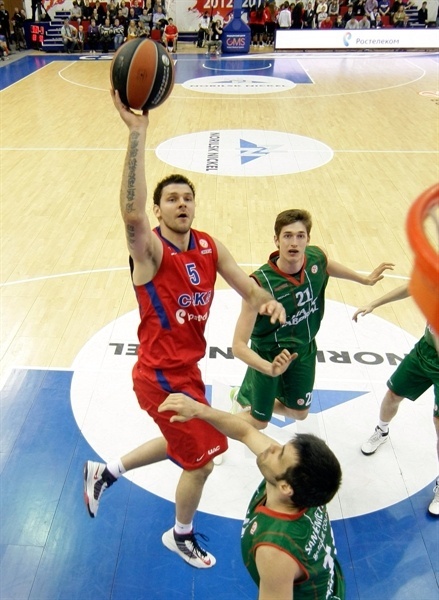 A Jackson layup capped a 15-2 CSKA charge. San Emeterio revived Vitoria with 4 quick points only to see Krstic finish the half with a jumper that made it 44-37. A blown defensive assignment left Khryapa open for a slam at the start of the second half. San Emeterio countered with a layup. Kaun and Lampe traded free throws before an impressive pass from Teodosic left Erceg with a layup and CSKA with a 49-41 lead. After Lampe and Kaun traded baskets, Khryapa’s baseline jumper made it a 10-point game. CSKA’s big men had another highlight in store as Erceg sent a laser pass to cutting Khryapa for a slam-and-foul. A Teodosic triple extended the lead to 61-43 and resulted in a Vitoria timeout. Khryapa capped a 14-0 run with a touchdown pass to Erceg for a layup and a 20-point lead. San Emeterio and Lampe scored for the visitors only to see Krstic match them each time. 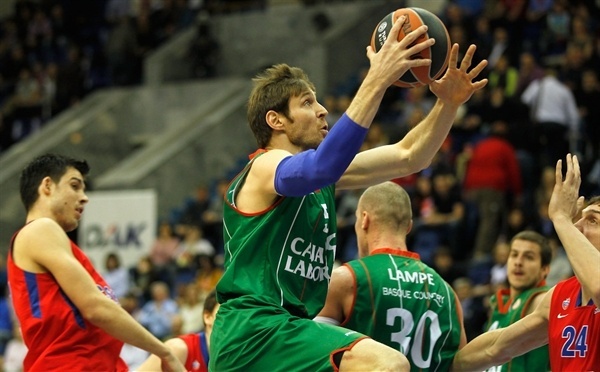 Fabien Causeur beat the third-quarter buzzer to make it 69-50 at the end of the quarter. 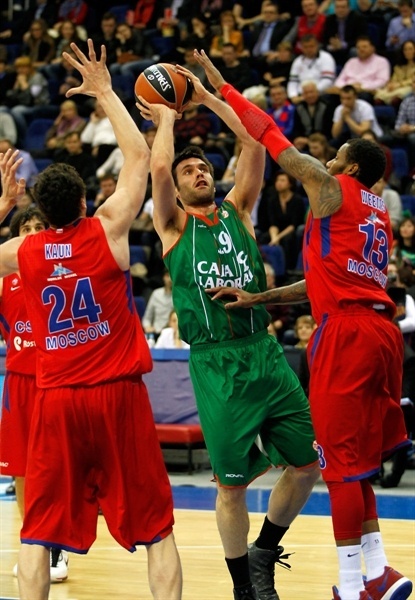 San Emeterio and Pleiss added baskets for Vitoria, but before long a Micov triple restored a 20-point margin. Any remaining doubts regarding the outcome were put to rest after Milko Bjelica committed an unsportsmanlike foul on Jackson. A Teodosic triple later lifted the margin to 83-58 midway through the quarter. Khryapa took the lead to 29 en route to victory. "I just have to say bravo to my players. It is not easy to beat a good team like Caja Laboral two times in three days and especially to play even better in the second game. We were down in the beginning, but I don’t think that was because of lack of effort. I think we were a bit tired and we needed time for our engines to start. I think Aaron Jackson played big role in making the team play at full speed. He did not score a lot – just 6 points – but he pushed the team. I am happy that in the first half the team did not panic, it remained calm and raised the defensive level. All of us can be proud of the second and third quarters. But the truth is that we just defended the home-court advantage. Now we go to Vitoria, a city of pride, and we will play a different game there. They will fight from the warm-up. We have to work with the same sense of togetherness we have now. Game by game we look more like a team." "We fought for two quarters only. In the third quarter the home team kept a good flow on offense and did not allow us anything on defense. Basically the game was over in the third quarter. We tried hard to get back in the game, but never succeeded. CSKA is one of two or three best teams in Europe. We just hope to do a better job on our court." "In the beginning of the game we played bad defense, but then scored lots of open shots. In the second and the two next quarters we were very aggressive and got a 25-point advantage. It seems like it was an easy game, but it wasn’t. In the next game, Caja Laboral will have home court and we expect a really tough game. We’ll try to show our best there and win the third one." "We started the game really good and didn’t let them play in offense or take rebounds. Then we just made couple of mistakes and CSKA punished us each time. That’s why they came back in the game and took a 20-point advantage. But on this court it’s difficult for us to come back as our opponent did."